An original, comprehensive and thoroughly researched account of Plymouth Argyle Football Club from its earliest roots to the present day. This chapter is licenced under a Creative Commons Licence. Attribution must include the Author (Roger Walters) and this site's address (www.greensonscreen.co.uk) and must be displayed prominently, in close proximity to any associated material, and be implemented with strict regard to the licence conditions. Parts too small for comfortable reading? Most browsers allow you to zoom. Try Ctrl+ (hold down the Ctrl key, then press the + key, without Shift). Have you new material to offer? Please get in touch by writing to Steve using the 'Contact Us' button at the top-right of the page. Photos used on this page: Greens on Screen is run as a service to fellow supporters, in all good faith, without commercial or private gain. I have no wish to abuse copyright regulations and apologise unreservedly if this occurs. If you own any of the material used on this page, and object to its inclusion, please get in touch using the 'Contact Us' button at the top-right of the page. This is a printed representation of one chapter of GoS's History of Argyle (www.greensonscreen.co.uk/argylehistorymenu.asp), provided for ease of reading and personal retention. Inevitably it lacks links to associated pages, including match and player records, and its layout has been simplified to allow page breaks. Note also that Greens on Screen's online History of Argyle will be updated and new material added from time to time. COPYRIGHT: the strict conditions for use of this printed version are the same for the corresponding online page, as specified on that page. In the first season of a new century and under the umbrella of a blossoming Argyle Athletic Club, Argyle FC enjoyed their first season with Home Park as their home. 1.1: missing links for the Wednesday fixtures have been added to the statistics box. The Argyle Cricket Club operated its second season at Marsh Mills through the summer of 1900. There were the First XI and Reserves operating on Saturdays and a Wednesday XI. The players included some from the Argyle Football Club; all members of the various sporting branches came under the Argyle Athletic Club banner. The Argyle Football Club held their annual dinner on the evening of Friday 11th May 1900, presided over by Clarence Spooner. Officials of the Devon F.A. and other clubs were present and the Argyle players received their gold League championship medals and the Defiance players their Devon County Cup medals. Amongst a number of congratulatory and acceptance speeches, the former Secretary of the Devon F.A., Sampson Caddy, urged Argyle, as Devon’s leading club, to take over where Plymouth United (Home Park A.F.C.) had left off and bring good teams from outside to Devon to raise the standards and gates of the local game. A month later, the Argyle Football Club held their annual meeting at the Argyle Athletic Club house on Mutley Plain. It was announced that, in addition to the existing Argyle Athletic Club branches of Association football, cricket, billiards, swimming, boating and camera club, it was proposed to form a Rugby club to play on Saturdays and a Wednesday “soccer” team. Wednesday football had declined in Plymouth in the latter years so Argyle offered the Devon F.A. a handsome silver cup to be competed for on a League system. The inauguration of the Devon Wednesday League ensured the formation of Argyle Wednesday to compete in it, whilst their second team, Argyle Wednesday ‘A’ played friendly matches. The captain of Argyle Wednesday was Albert William Dring, who worked in a draper’s shop. Wednesday was his half day off; he never played for Argyle on a Saturday. Many of the other Wednesday players were also shop workers whose job prevented them playing for Argyle on a Saturday. The Argyle Rugby Football Club appointed its own officials who formed a ‘First XV’, captained by former Blundell’s public school pupil Francis Edmund Coppin, and a ‘Reserve XV’ captained by George F. Newman who had played Association football for Argyle Reserves in 1898-99 and 1899-1900 seasons. 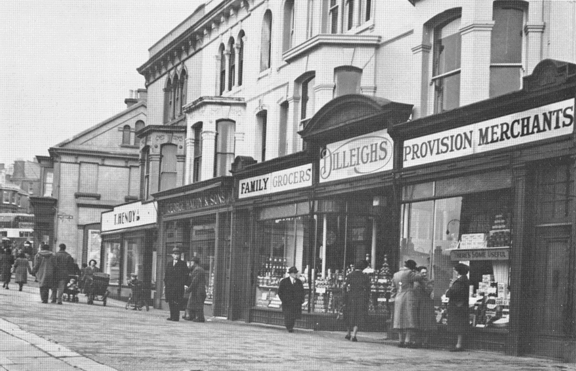 From 1st July 1899 to January 1901, the club rooms were in the basement of the shop, here occupied by George Haddy & Sons (Grocers), between T. Hendy (Butchers) and Dilleighs (Provision Merchants). In 1935 to 1938 the basement was home to Robert Tucker's Billiard Hall. When the Argyle Athletic Club was in the basement, the shop business belonged to James Roberts (Restaurant and Tobacconist). The Argyle Athletic Club had grown from 35 members a year ago to 150 in July 1900. Their annual meeting was held on Monday 30th July 1900 at the club premises on Mutley Plain. Clarence N. Spooner was re-elected President and he announced that the club had taken Home Park for the ensuing season. As it was rather a big venture, he urged the members to do all they could amongst their friends to support their club and make it popular. The taken lease of the Home Park Ground was in the name of C. N. Spooner. Last season's tenants of Home Park, the Plymouth Football Club, had finished bottom of the Devon Senior League and rather than suffer the ignominy of relegation, they entered no League and acquired no ground for the 1900-01 season. The newly formed Argyle Rugby Football Club had requested the Plymouth Rugby Football Club to propose them as members of the Devon Rugby Union. One of the club’s officials denied reports that they had refused to do so. They had grounds for not supporting the request, as a number of ex Plymouth R.F.C. players populated Argyle’s First XV when the season began. There were allegations that the Argyle Rugby Football Club was paying players for their services, which Clarence Spooner denied in a published letter to the Western Daily Mercury. Argyle R.F.C. was accepted and entered the Plymouth division of the regional Devon Junior Cup. It was basically, ‘Division Two’, the senior competition being ‘Division One’. As Argyle had a total of six Association and Rugby football teams, the Marsh Mills ground was not given up for 1900-01. It was used as ‘home’ venue by both the Saturday and Wednesday Association football 2nd XIs and only occasionally by both 1st XIs. The ground was not known to have been used by either of Argyle’s rugby teams. Both Argyle’s Association and Rugby teams were able to try out Home Park for the first time in practice matches played on Saturday 1st September 1900. It was the Argyle Rugby Football Club ‘First XV’ who were the first to, officially, play at Home Park a week later in their very first match. St. Barnabas (Devonport) were beaten 5 points to nil. The First XV were again at ‘home’ on the 15th September when Belair (Pennycross) were defeated 9 points to 3. Dispelling the notion that players performing acrobatics in celebration of scoring is a modern phenomenon, when Belair scored a try their players were so elated to have scored against such an organisation as Argyle, that they turned summersaults. The very first Home Park ‘home’ match played by the Argyle (Association) Football Club occurred on Saturday 22nd September 1900 in a Devon League Division One fixture versus the 1st Battalion Royal Welsh Fusiliers. The honour of scoring Argyle’s first ‘home’ goal at Home Park went to Anson Crouch, son of the Argyle F.C. Treasurer and Argyle Athletic Club Secretary, Francis Crouch. Argyle led 3-0 at half time, and finally won 6-1. In the first two months of the 1900-01 season, up to the beginning of November, the First teams of the Argyle Football Club and Argyle Rugby Club had not lost a single match. Membership of the Argyle Athletic Club had grown further to 192 members and its Mutley Plain Social Club “is most popular” according to the Football Herald, which now carried a regular weekly article, headed “Argyle Club Notes” within its columns. The football teams practiced on Tuesday and Thursday evenings and the Argyle executive were gratified that so many players regularly attended. All members of the football teams were requested to attend; club runs started from the Mutley clubhouse at 7:30 p.m. Positive results from the training soon came as Argyle were commended in match reports for their assertive and skilful play. The players' fitness had improved so much that, for the first time in the history of Devon Association football, a civilian club had equal or superior stamina to that of the Army players, as results were showing. The Social Club at Mutley had become too small for the growing membership. On the 27th October 1900, the Press announced that splendid larger quarters at 82, Old Town Street had been secured and the Argyle Athletic Club committee hoped to take possession at Christmas. In 1900, the new Devonport tramway was taking shape and the 196 feet long Electric Tramcar Shed at Milehouse (a familiar landmark until replaced in 1985) was being built. In October 1900, the liquidators of the Home Park Recreation Ground were in negotiation to sell ownership to the Devonport & District Electric Tramway Company, part of the national British Electric Traction Group. This was seen as mutually beneficial as the Home Park Ground would be, for the first time, on regular transport routes. As soon as services operated, it was expected the venue would be increasingly visited and used and with it, passenger numbers would grow. The under-used and owner-less ground, though only a few years old, had fallen into a state of disrepair. At the beginning of November 1900, the new B.E.T. owners said they intend to update the facilities and re-lay the cycle track. The original Home Park Company, allowing for earth settlement, never permanently finished the surface in concrete as planned. The levelling of steep hills in Devonport and wrangles with the Admiralty had delayed the completion of the private enterprise tramway. The contractor laying the Devonport tramway and builder of the Milehouse Tramcar Shed was Faulkes & Sons of Loughborough. During the 1900-01 season, the ‘Sons’, Arthur and Charles Faulkes, both played for Argyle. It was decided not to open the network until the whole system was completed. At this time, the track had been laid from Fore Street to Milehouse via Albert Road. Steep ground from Pennycomequick along Saltash Road (later named Alma Road) out to Milehouse, and boundary borders meant that Home Park was connected by transport, first to Devonport, rather than Plymouth. 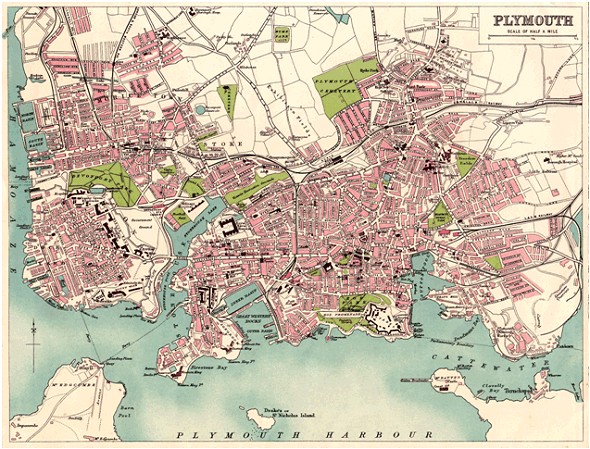 The two-pronged northerly housing growth of Devonport toward St. Budeaux, and Plymouth toward Peverell and Pennycross were gradually encompassing Home Park, at the north end of the Exhibition Fields. The ground was losing its countrified isolation and transport routes came out of Plymouth and Devonport into the new suburbs. Though the tramway had yet to open, large numbers of people were to be seen, on Saturday 3rd November 1900, wending their way on the path-fields to Home Park to witness the Devon League Division One encounter between two unbeaten clubs, Argyle and Green Waves. The crowd was enthusiastic and their fire maintained through the match. Play was hot and Argyle’s attacking play was vigorous. They went ahead 1-0 after 15 minutes. The applause of the crowd inspired both teams to “even greater efforts, with the result that splendid chances on either side were nullified by over-excitement” said the Western Evening Herald Tuesday report. The game was full of incident and clever work by both sides up to the “breather”. Fortune changed in the second half as Green Waves kept up “continual bombardment on the Argyle goal for fully thirty minutes, and only a grand defence saved them times innumerable”. Green Waves equalised and the jubilant cheers of the “fishermen” (Green Wave supporters) filled the Home Park air. A battle ensued for the winning point. Argyle struggled to repel the invaders until outside right, George Holmes...“impatient of having nothing to do, ran across to the centre, and dashed off with the ball at his toes. Grandly breaking down all opposition, he finally gave to Burge, who netted the sphere amidst tremendous excitement”. Argyle attacked to the end. The 2-1 victory sent them three points clear of Green Waves at the top of the League. The reporter said it was the best game for years and he “craved” for more! Home Park had come alive from its prolonged slumber and Argyle had found its true home. Eleven days after the Green Waves match, Argyle had four players (Buchan, Pethick, Dann, and Holmes) in the Devon County team that defeated Cornwall 3-0 at the Rectory. The only Argyle player chosen by Devon throughout the season was their great goalkeeper, Percy Buchan. On Saturday 27th October 1900, the Argyle Rugby Club had gained its first Devon County Cap when Ernie “Nipper” Clark played at three-quarter back and scored two tries in Devon’s 24 points to nil defeat of Yorkshire at The Rectory before a 10,000 crowd. Clark was one of only two players capped that season from junior clubs. He played again on 17th November 1900 versus Cornwall, at Camborne, in the South West Counties Championship. Devon won 6 points to nil. 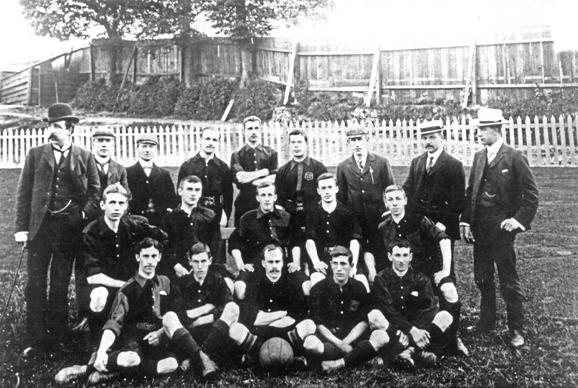 Devon became the English County Champions by the end of the 1900-01 season. Since the Northern Rugby split from the R.F.U., Devon were the top Rugby Union County at this time and Devonport’s Albion Rugby Football Club was in the top handful of clubs in Great Britain and amongst the best supported. On 24th November 1900, the fixture against Swansea attracted 15,000 to The Rectory, Devonport. Always a tight compact ground and little changed in over 100 years; it seems an impossible number when looking at the ground now. Plymouth Rugby Club was also attracting thousands to its South Devon Place ground. Clarence Spooner often fought against injustice and over-bearing authority and was dismayed by poor standards. No matter was too trivial. He regularly attended meetings of the Devon County Football Association as the Argyle representative, seeking to influence proceedings. He did so on 1st December 1900 when he complained about the treatment of club secretaries. They had to wait for long periods on the stairs whilst the executive were hearing and considering the many protests, until the result was shouted down to them. The Devon F.A. Senior Secretary, George Jones, apologised and promised a waiting room would be provided. Spooner also made an issue regarding the sixty or so referees in Devon and Cornwall; only a handful regularly turned up on time. That day the referee had failed to turn up at Marsh Mills for the Argyle Reserves ‘home’ Devon League Division Two match. Three months earlier in September 1900, the vacancy for Devon County Senior Secretary had two candidates, the Argyle Football Club Secretary Tom Floyd and the Secretary of the Devon & Cornwall Referees Association, George Jones. Mr. Jones was elected. The Argyle First XI unbeaten record came to an end on the 8th December 1900, losing their return ‘away’ Devon League match versus Green Waves 2-1, and a week later lost again in the League, 1-0 at Tavistock. On the Torland ground, high above Tavistock, Argyle’s confidence had ebbed away and only the brilliance of goalkeeper Percy Buchan kept the score respectable. They remained at the top of the League but Green Waves and Tavistock were both only two points behind with two games in hand. Argyle accepted invitations to play Christmas matches in Cornwall, with a fixture at St. Austell on Boxing Day and Launceston on the 27th December. The ‘St. Austell Star and Cornish Advertiser’ reports an “enormous” gate of 1,200 were present in “genial atmospheric conditions” but these conditions intensified for the worse when it was learnt that Argyle would not play with a St. Austell man as referee and had, in fact, brought their own referee to arbitrate. Local feelings ran high and inspired the local team. The incensed journalist, fuelled by reports of the current South African (Boer) War, describes the game itself as “war” and Argyle as the “enemy”. Enemy territory suffered a “bombardment”. Argyle’s own referee could not save them though the resolute Buchan defended the “citadel” until just before “lemon time” (half time) when he was beaten by the only goal of the match. The following day, in less intense conditions at Pennygillam, Launceston and Argyle drew 2-2. With the season looking as if it could fall apart, Argyle steadied the ship with a 2-0 Devon League victory over the bottom club Oreston Rovers on the 29th December 1900. As the year ended, the Reserves were finding it difficult to fulfil fixtures following the departure of the captain and vice-captain; the Argyle Wednesday First XI was in second position in the Devon Wednesday League; the Wednesday ‘A’ team struggled in their friendly matches. The Argyle Rugby Football Club First XV reached the end of the year with only one defeat and was unbeaten in the Devon Junior Cup. The Cup’s initial stage was on a regional League basis before the final knockout rounds. Similarly, as the Association story, the Argyle Rugby Football Club Reserve XV were not doing well. Their esteemed President, Clarence Spooner, publicly and formally opened the Argyle Athletic Club’s new spacious headquarters, at 80-82, Old Town Street, at 7.30 p.m., Saturday 5th January 1901. Old Town Street had been widened and improved in the late 1890’s and the premises were situated within 'New Town Chambers', on the east-side of Old Town Street, on the second floor (the location on a modern day map is close to the junction of Old Town Street with New George Street). On the other (west) side of the road, nearby, was the Spooner & Co department store. The Argyle Athletic Club venture was a suggestion of Clarence Spooner to facilitate the physical and mental training of members and building comradeship to enable the football and cricket sections to build on their great success. The growing membership had necessitated a move from the inadequate Mutley base to the suite of rooms, which took up the whole of the second floor. A builder carried out structural alterations and Messrs Spooner & Co. carried out the fittings and upholstery work. The floors of the card-rooms were fitted out with best quality linoleum and the wall decoration was artistic and costly. All the furniture was of the best quality and everything was tasteful and cosy. There was a reading and writing room, two excellent Billiard rooms, which contained the best modern tables, and there was a first-class bar. The steward of the club, Thomas Lamb, lived at 81, Old Town Street. The location was chosen to be in easy reach for members to drop in for a few minutes during the day if they so wished. Argyle’s apparent wealth and its enticement of wanted sportsmen led to nudge and wink opinions as to their 'amateur' status. Clarence Spooner and the members of the committee strenuously denied all suggestions of professionalism, within its sporting teams. During the opening evening’s speeches, the amateur protestations seemed over emphasised and halfhearted, not made any better by expressing the need for more members of quality as well as quantity. There seems to have been some surprise within the club at the rapid rise of the newly formed Argyle Rugby Football Club, this had not been anticipated. The Association Football Club Secretary, Tom Floyd, looked forward to them joining the top rank along with Albion R.F.C. and Plymouth R.F.C. ; this was greeted with loud cheers and shouts of “hear, hear”. The Saltash club, Essa, following a long-winded and unfathomable dispute with the Devon F.A. decided to leave the Devon League mid season causing the league table to be re-calculated. Argyle had played Essa once and drew 1-1 so lost only 1 point, whilst Green Waves lost 4 points for two wins. The new table, published on 8th January 1901, left Argyle on top (Played 10 on 15 Points), Tavistock in 2nd place (P 9, 14 Pts), and the points gap widened to 3rd place Green Waves (P7, 8 Pts). Every season ridiculous disputes over minor issues led to clubs leaving during the season; sometimes Service teams had to leave because of deployment elsewhere, such as the war in South Africa. Consequently, points were deducted and the League matches expunged. Conversely, many of the struggling clubs failed to fulfil fixtures; therefore, opponents were given the two points, though sometimes not. Some results were officially reversed following protests. Occasionally, to help complete fixtures, a Cup match was also played for League points (Argyle v Oreston Rovers on 29 March 1902). The erring Devon County Football Association did not make the resultant League table turmoil clear. Official League tables were significant by their absence and generally, all that was certain at the end of the season was who the Champions were, and who were runners-up as they received the Cup and medals. The only real progress was that the number of instances of dispute was falling. The Argyle Athletic Club’s announced intention of acquiring members of 'quality' was in effect them creaming off the best local players for the Argyle Football Club. Considering what was on offer (including allegations of remuneration) players jumped at the chance of joining. Argyle acquired players by stealth, as they did Theodore Stideford of Green Waves. He played for Argyle at least three times as an invited guest in ‘Friendly’ matches, thus no Devon F.A. rules were broken, after which the player was asking his club for a transfer to Argyle. Green Waves accused Argyle of poaching and the case was brought before the Devon F.A. on Monday 14th January 1901 at the Borough Arms, possibly in the same room that Argyle had formed fifteen years earlier. The committee heard evidence from Green Waves, Stideford, and Clarence Spooner on behalf of Argyle. The charge was deemed not proven and Stideford was allowed to join Argyle by his own request the same evening. Also making a request for a transfer to Argyle was Charlie Webb of Oreston Rovers who, like Stideford, had also played as an invited guest. The Devon F.A., on objection by Oreston Rovers, refused that evening his request but inevitably, he was permitted to join Argyle a month later. According to Tommy Haynes, who later joined Argyle from Oreston Rovers and was professionally associated with Plymouth Argyle for many years, it was the Argyle President, Clarence Spooner, who directly approached both him and Charlie Webb. The other Devon senior clubs were becoming increasingly anti-Argyle; this may have been the reason why the only Argyle player to feature regularly in the Devon County teams for 1900-01 was goalkeeper Percy Buchan. Argyle may have been the main instigators but were not the only club to entice players. Sometimes Argyle were the victims as was the case with their player Hugh Phillips in the 1901-02 season. He was a Navy man signed to Argyle and called before the Devon F.A. for, inexplicably, also signing for Devon League Division One rivals Crownhill. At the inquiry he told the committee he signed for Crownhill F.C. “…in a weak moment after an enjoyable evening”. After the laughter died down, he was merely ordered by the Devon F.A. to obtain a transfer from Argyle to Crownhill; perhaps considered punishment enough. The annual general meeting took place at the Club’s new Old Town Street headquarters on the evening of 25th January 1901. With Clarence Spooner in the chair and a very large attendance, all stood to pay their respects to Queen Victoria, who had died three days earlier, and to pledge allegiance to the new King. The members sat down to begin the meeting. The Argyle Athletic Club Dance Committee reported a profit of £7, the new Wednesday branch of Argyle F.C. had been a success and some of its players intended to form a Wednesday branch of the cricket team. The captain of the Saturday Cricket XI, Percy Buchan, gave the report for 1900. Matters then turned to the future organisation of the club. The President drew attention to the new set-up and that the Club were owners, not tenants as they were at the Mutley address. They owned all the fixtures and were geared up for expansion. Spooner proposed, and the committee had agreed, to recommend to members that the club be formed into a limited liability company confined to members only with a nominal capital of £2,000 divided into 16,000 shares of half-a-crown (12½ pence) each. Every member was to have at least one share and dividends would be paid to those holding eight shares or more. It was proposed to form a Sports Committee to deal directly with the General Committee and that the qualification to be a Director was 40 shares (£5). There were currently 223 members and more continually joining. The list would open from that day for a fortnight at the club rooms, the Public not being allowed to subscribe. If any shares were not taken up, Clarence Spooner was prepared to take them himself. The President moved the motion; it was seconded, and carried. John Dawson Spooner proposed that their esteemed honorary Secretary, Francis Crouch, be given 800 shares (£100) in thanks of all the good work he had done. This goodwill gesture was carried unanimously. A group, including Argyle Association and Rugby players was formed to draw up the necessary documents. The proposed Sports Committee was formed and John “Jack” Jaques voted onto it. He had invaluable experience with the Home Park Association Football Club, in the first attempt to bring professional football to Plymouth. The Argyle Athletic Club contemplated establishing more branches, including swimming, rowing and tennis. At the end of a history defining evening, the balance sheet for the year ending December 1900 showed a balance in hand of £3 15s 1d. The forming of the Argyle Athletic Club Limited can be considered the start of Argyle’s journey into professional League football, yet the decision led to dire consequences, almost putting the Argyle Football Club out of business during the 1901-02 season. The planned metamorphosis into a professional League football club came close to ruin. As the end of the 1900-01 season approached the various Argyle football teams were experiencing very different levels of success. The teams for whom Home Park was ‘home’ ground were flourishing. At the end of March, with two games left to play, the Argyle (Association) First XI remained at the top of the Devon League Division One with Tavistock close in second place. Argyle had been knocked out of the Devon Senior Cup in a 2nd Round Replay by Depot Royal Artillery at Home Park on Saturday 23rd March 1901. Argyle appealed against the 2-0 defeat, which the Devon F.A. over-ruled. The Association Cup match was part of a double-header fixture at Home Park during the longer daylight months. The kick off at 4.00 p.m. followed the Argyle Rugby Football Club’s First XV win over the Cornish Champions, Redruth, 4 points to nil. Spectators paid one admission price to see both matches. The Rugby First XV had won all twelve of their Devon Junior Cup (Plymouth Division) matches to progress to the semi-final to play Teignmouth (winners of the Torquay Division). On 9th March 1901, at Newton Abbot, Argyle deservedly won by 8 points to nil to reach the Final. The Argyle (Association) Wednesday First XI had also been fairly successful in the Devon Wednesday League, finishing the season runners-up to the Depot Royal Artillery. 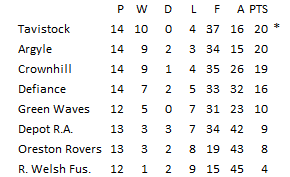 The Argyle (Association) Reserve XI finished bottom of the Devon League Division Two (A section). It had been a troublesome season; they only managed to fulfil 10 of their 16 League matches and were knocked out of the Devon Junior Cup 8-0. Like poor relations, ‘home’ was Marsh Mills, not salubrious Home Park. On a rare occasion that the Reserves were ahead, 2-1 versus Crownhill Reserves on 9th February 1901, the River Plym claimed the match ball. There was no replacement ball available and the match had to be abandoned. A rematch was not arranged and the points were forfeited to Crownhill Reserves. The other Marsh Mills based team, Argyle (Association) Wednesday ‘A’, lost the majority of their ‘Friendly’ only matches. The Argyle Rugby Football Club Reserves are not known to have had a successful season. 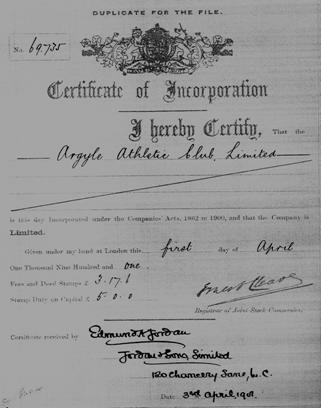 Argyle Athletic Club Limited was granted its Certificate of Incorporation on the 1st April 1901. The Memorandum shows that it did not intend just to be a club for members. Its objectives, listed under number 3, are ‘(d) To promote Football, Cricket, Lawn Tennis, and all other Athletic sports and pastimes, (e) To provide Football and Cricket, and other grounds for the purpose of all other Athletic Sports and pastimes and of the Company, and to provide stands for the accommodation of the public, or otherwise pavilions, lavatories, refreshment rooms, and other conveniences therewith’. The membership was affordable to all, one share 2s 6d (12½ decimal pence) and no further entrance fees, though there was an annual subscription of 10s 6d (52½ pence). To be a Director at least 40 shares had to be held costing £5, possibly just too much for an unskilled labourer to pay out. The Argyle Athletic Club Limited presented documents to show how much control the Directors had over the Club. Shares/membership could only be issued to persons subject to the Directors' approval, who could also expel members. The specified number of Directors was to be between 7 to 9, and the Articles state that a Directors vote shall not count “If he is found lunatic or becomes of unsound mind”. Directors could be removed at any time by special resolution. With such controlling measures, it begs the question “who is or are the controllers”? The answer has to be Clarence and John D. Spooner. The Argyle Athletic Club Limited venture was costing money that for the most part was paid out of Spooner pockets not share issues. Clarence Spooner said that 16,000 shares would be issued to raise £2,000 but by the 26th February 1901, only 3,601 had been issued, and 800 of those were a gift to Secretary Francis Crouch. If everyone had paid for the remaining 2,831 cash shares, only £353 17s 6d had been raised. Of the 2,831 cash shares, Clarence Spooner owned 800, John D. Spooner 240, with brothers Stanley Spooner owning 160, and Guy L. Spooner (the Club’s solicitor) 80 shares. There were over 230 share holder/members owning the remaining 1,280 shares yielding only £160 of non-Spooner money. The majority of the members acquired just one share. The first nine Directors included Clarence Spooner, John Dawson Spooner and players – Charles Hedley Hoskin (Argyle (Association) F.C. ), Reginald Goldsworthy (Secretary of Argyle Rugby Football Club), and Sydney Cole (who played occasionally for both football branches). Prominent Argyle names amongst the shareholders include the man largely responsible for Argyle’s survival during the bad times Victor Prout (1 share), and John “Jack” Jaques (80 shares). Jaques owned a chimney sweep business, in Old Town Street, but his occupation is listed as “Trainer”. He organised many cycling and athletic events on behalf of the club. As 1901 progressed, there were fewer and fewer new members and the likelihood of selling 16,000 shares was never a reality or probably even an intention. On the 14th June 1901 the Argyle Athletic Club Limited figures show they had only received £308 2s 6d, with expenses listed as - Formation Expenses: £133 9s 6d; Purchase of Home Park: £100; Bank Overdraft: £174 13s 0d. It seems that some people enjoyed the facilities of the Argyle Athletic Club without any payment of the minimum one share. Secretary, Francis Crouch, in sending the returns for October 1901 to the Registrar, Companies Registration Office in London, included a “Memorandum from Secretary”. He writes that some returns have been incorrect because “…as in a Football Club, the members are continuously joining and coming, and after leave the district a few days after a share has been allocated them and not paid for !”. The Argyle quest for Cups was held up by a fixture lull during April. The first annual Argyle Athletic Club (Easter Holiday) Sports, held at Home Park on Friday 5th April 1901, brought together both Association and Rugby football clubs. The ground was in lovely condition; the grandstand was well filled with 3,000 spectators to witness the new event. The contestants were 20 or so various Plymouth area club sides competing in team events and individual events representing the team. They included Argyle, Argyle Wednesday, Argyle Rugby Club, Green Waves, Crownhill, Oreston Rovers, Defiance, Depot Royal Artillery, Royal Marines, Royal Naval Engineering College, Belleville, St. Barnabas, and 1st Co. Boys Brigade. The prolonged sports included Athletics and a Football six-a-side contest for senior and junior teams where gold and silver medals were awarded. Crowd interest was high and there was continuous loud cheering. All of the junior matches, except the final, were played on the higher field behind the grandstand. Many Argyle Athletic Club members officiated, judged and refereed; Clarence Spooner distributed the prizes at the end. It was also an opportunity for Argyle to scout for talented sportsmen. The next day, Saturday 6th April 1901, Tavistock thrashed Depot Royal Artillery 8-0 in the Devon League to draw level with Argyle on 18 points at the top. The published table kept Argyle (played 12) in the position they held all season, 1st, even though Tavistock (played 13) had a superior goal difference following their big win. Tavistock and Depot R.A. were to meet again in the Devon Senior Cup Final. It is reported that the Depot R.A., who had no chance of winning the League, held back their best players for the Cup Final. The reporter in the Herald wrote that the score should not deceive people. He was right; they did defeat Tavistock, 2-1, in the Devon Cup Final. It is not unreasonable to think the Depot R.A. and Tavistock had come to a special arrangement. Argyle had two League games in hand so felt their fate was still in their hands. For some reason the Press assumed that Argyle were going to be League champions again. The likelihood of a conspiracy to prevent Argyle winning the title gathered some credulity on Saturday 20th April 1901, at Home Park in the League encounter versus Oreston Rovers. After Argyle went 1-0 up the Oreston Rovers players grossly over reacted to this goal. The club were second from bottom in the League though not in any danger. Argyle had caused some acrimony with Oreston Rovers in a dispute earlier in the season over Charlie Webb who was playing in this match against his former club. The referee, Mr. Pawley, was strongly questioned for allowing the goal and the Rovers players became so unruly in the ensuing play that he oddly abandoned the match after only 35 minutes. On the same day Tavistock were playing their final League match at home to Green Waves. At half time Green Waves, assisted by a strong breeze, were ahead 1-0. Tavistock delighted the large crowd in the second half, turning the match round to enable a significant 5-1 victory. The win meant they finished their season two points clear of Argyle at the top with a now far superior goal difference. Argyle had to achieve three points out of four in their uncompleted games, or win one match by a substantial number of goals to gain the title. There was some good news on the same April day. In their first season, the Argyle Rugby Football Club easily defeated Cullompton at Plainmoor, Torquay to win the Devon Rugby Junior Cup Final. Playing brilliant modern attacking rugby, they wore down their opponents to gain mastery and win 21 points (7 tries) to nil. This afforded them the honour of joining the senior ranks next season. A week later, in their last match of 1900-01 they were invited back to Plainmoor to face senior opposition, Torquay Athletic. The Western Daily Mercury says, “The young Plymouth Club gave the Athletics a splendid game, and lost by only eight points to four”. The Devon F.A. ordered the abandoned Oreston Rovers match to be replayed and suspended the linesman, Langman of Oreston. The rearranged date made it the final match of the season on Monday 29th April 1901. Two days before that Argyle faced a League fixture against Defiance on their Carbeile ground, Torpoint. The opponents were mid table but anxiety had taken over the Argyle players, and their supporters, in a game that, at least, needed to be drawn. Argyle were nervous and their attack resorted to off target long shots at goal, easy chances went begging. Fears materialised in the second half as Defiance went 1-0 up. Though they needed an equaliser, Argyle were kept on the defensive, and harassed, by their opponent’s organised attacks. John Fairweather missed a header from a fine cross to equalise and save Argyle’s season, followed by Bertie Oke shooting over the bar. Defiance scored again to win 2-0. The Western Daily Mercury report, vastly understating, concludes, “This leaves Tavistock still a chance for the League Championship”. It seems crazy now, but nobody at the time realised that, thanks to Tavistock’s 13-1 goal aggregate in their last two games, Argyle needed to win their final match versus Oreston Rovers by at least nine clear goals, a situation caused by incorrectly compiled League tables. Devon League Division One Final 1900-01 Table (Published 30-4-1901). Statistically correct except Goals Total, For = 238, Goals Total, Against = 242. *Tavistock record of goals, as explained in the text, should be 42-17. This makes the Goals Total For = 243, Goals Total Against = 243. This is statistically correct. It is not known if the Devon F.A. had deliberated on the three un-played matches. Argyle won their replayed League match versus Oreston Rovers 4-1 on Monday 29th April 1901 to draw level on twenty points with Tavistock but there was doubt and confusion for the next few days as to which of the two clubs were indeed 'Champions'. A decision had to be made so the Devon F.A. were forced to hold a special committee meeting on the 4th May 1901 to determine which of the two it was. It was finally declared that Tavistock were Champions on goal average. Argyle immediately appealed because Tavistock had not paid their League expenses. This charge was not upheld. The Final Devon League Division One Table (right), published on 30th April 1901 shows three matches were not played or result determined. A comparison of this with the table published on the 10th April 1901 shows that Tavistock’s 5-1 win over Green Waves is not included in their goal figures but is on the Green Waves record. Therefore, Tavistock were correctly declared 'Champions' but the goal difference was significantly more than that published. The Tavistock record should be – Goals For: 42, Goals Against: 17. Argyle’s record is correct as shown. Clarence Newby Spooner was very angry and felt Argyle were the true Champions. At the Argyle Athletic Club Dinner on the 21st May 1901, held so that the Devon R.F.U. could present the Devon Junior Cup to the Argyle Rugby Football Club, Clarence Spooner, as Chairman, said that the Devon F.A. Committee had “robbed” Argyle Association of retaining the League Cup. He told the gathering he had had the cup analysed (before passing it back to the Devon F.A.) and it was found to be a mixture of lead and alloy, though it was supposed to be a silver cup valued at twenty-five guineas. He had written to the English F.A. but they told him the matter was out of their jurisdiction. His seemly childish fit of pique was taken seriously by the gathered members because they knew the depth of feeling he had for Argyle. The evening speeches spoke of being “proud” to have such a man as their leader who had “piloted” Argyle to success. Clarence Spooner said he had taken it upon himself to present each of the Argyle Football Club players with a gold medal and Percy Buchan, accompanied by warm applause, passed each medal to the recipient. The hallmarked medal is a 1 inch by 1 inch decorated Maltese cross, with the players name engraved in the middle, and on the back, engraved “ARGYLE – LEAGUE – 1900-01”. Argyle Football Club 1900-01 at Home Park, at the end of the season. (back row, standing): John Dawson Spooner, Clifton Pethick, Thomas Floyd (hon. Secretary), Fred Lillicrap, Percy Buchan, William T. Dyer, Albert Ledington, George F. Vaughan, Clarence Newby Spooner (President). (middle row): John W. Fairweather, Charles Hedley Hoskin, Theodore Stideford, Reg Dann (Captain), Anson Crouch. (front row): George Percival Holmes, Alfred Shaw, George B. Bryan, Bert F. Oke, Charlie Webb. The Home Park Ground was not known to have been used for cricket until it became home for the Argyle Cricket Club. It was a splendid place for Cricket matches, especially for the big hitting batsmen. The wicket itself was a strip of coconut matting in the centre of the pitch. Some batsmen attempted to thump the ball onto the grandstand roof or into the stand, which had glass at either end. The condition of the grass varied after each football season. In May 1901, for an Argyle Cricket Club match against Totnes, the turf was described as in “splendid” condition. At the beginning of June 1903, the ground was in bad condition making fielding difficult. Similarly, as at Home Park, the Albion Cricket Club used the Rectory football ground for cricket. The other developed football ground in Plymouth at South Devon Place, was different in that it started off as a cricket ground, being the home of the Plymouth Cricket Club for many years, before being adapted as a terraced football ground. Click here for a full list of references. Feel free to leave your thoughts about this chapter by completing the boxes below. If you have a general comment to make about the history project as a whole, please use the feedback facility on the contents page.